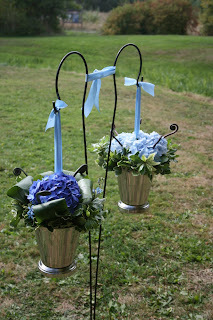 Several tones of blue hydrangea accented with chocolate fern curls are designed in silver pails suspended by periwinkle ribbon on black shepherds hooks. 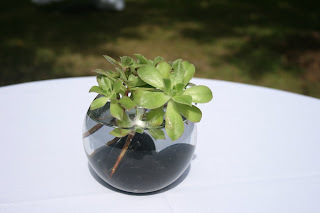 These marked the front of a secret entrance to the ceremeny site at UW’s Center for Urban Horticulture. 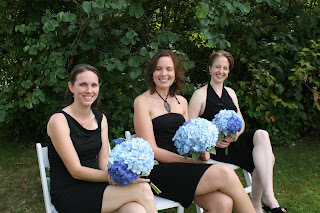 Large hydrangea blooms were simply wrapped with black satin ribbon to coordinate with these simple, stylish bridesmaids dresses. 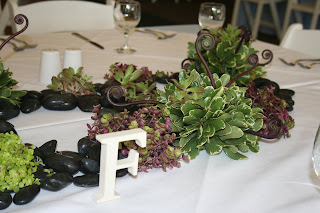 Succulents anyone?… cocktail tables were adorned with various types of succulent plants floating in tiny bubble bowls with black river rock. 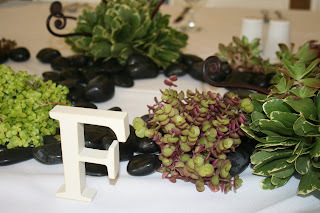 Centerpieces consisted of “table-scapes” of succulents, black river rock, and miniature florals of chocolate and green fiddlehead fern curls.